Easy to set up and run proper 1D, 2D, or 3D periodic calculations with the excellent GUI. AO-based periodic DFT, accurate relativity, orbital and DOS analysis. or Try the Amsterdam Modeling Suite! Our periodic DFT code BAND shares many of the benefits with our powerful molecular DFT code ADF. Using atomic orbitals for periodic DFT calculations has a number of advantages over plane waves. Why use BAND instead of a plane wave code? BAND is particularly well suited for studying low-dimensional or empty systems, when you need (core) spectroscopic properties, and/or access to orbital properties and advanced analysis. 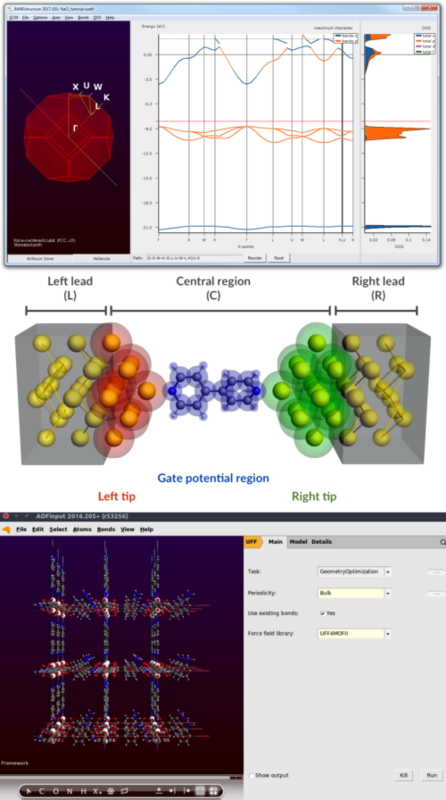 Our whole ADF Modeling Suite is a powerful computational chemistry package for tackling difficult problems in all areas of chemistry and materials science, see the specific capabilities per research area. The SCM team is always happy to discuss whether our software is suitable for your research questions.